Yosemite is one of my favotite places. The Mariposa Grove on the south side of the park is truly a magical place. There are several groves of old growth redwoods in the northern parts of the state as well. Redwood National Park has most of them. To me, ‘Avenue of the Giants’ qualifies as one of the best drives in California. Another beautiful place where these giants (Coastal Redwoods) reign is the Rockefeller Forest in Humboldt Redwood State Park. Just magnificient. I have not been to Redwood National Park. The Avenue of Giants is truly magnificient. 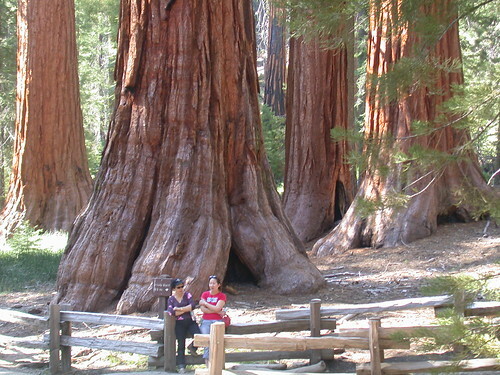 Have you been to Kings Canyon and Sequoia National Park? Nope. In spite of having lived in the Bay Area for 8 years, I still haven’t gone to either Kings or Sequioa National Parks. Definitely on the list though. Imagine San Francisco without the people, buildings, roads et al. That is Redwoods NP (&Stae Park). Cool, foggy and just breathtaking. The Sequioas are bigger at the base, but the Redwoods are much taller. It’s a pity that only 3% of the old growth Redwoods are still left. I was driving down from Oregon (after a visit to Crater Lake NP) to Crescent City, Ca and stopped at Jedidah State Park. My parents were with me and we went for a stroll. There was barely enough light. No one else on the trail. The only sound was the gasps from the three of us. Just fabulous. Redwoods NP is one of those places that doesn’t get the attention it deserves. Humboldt State Park is just to the west of the Avenue of the Giants and of you are in the area, do not miss it. The tallest tree in the country is in there. Spectacular. The Giant Sequoias are on my to do list, but I’m very inclined to hike and explore coast forests. Not sure if I’d like to see the Giant Sequoias in the snow season or warm season. Im going to see all those places and their glorious sites with my soon to be wife. Cant wait untill June.